Habit: Shrub, unarmed. Leaf: simple, oblong to (ob)ovate, generally serrate, deciduous; stipules generally 0; petiole 0--short. Inflorescence: raceme or panicle, many-flowered, bracted; pedicel bractlet generally 1, at top, generally linear. Flower: hypanthium obconic to bell-shaped, bractlets 0; sepals spreading to erect; petals spreading, pink to rose; stamens 15--many; pistils 5, opposite petals, free or fused at base, surrounded by hypanthium, ovaries superior, styles +- terminal, beak-like in fruit, stigmas head-like. Fruit: follicles 5, dehiscent along adaxial, top of abaxial suture. Seed: +- fusiform; coats membranous. Habit: Plant 2--9 dm, glabrous to sparsely fine-hairy. Leaf: generally ovate, generally 1--7 cm; petiole < 3 mm. Flower: hypanthium 2--2.5 mm; sepals +- 1 mm; petals +- 1.5 mm, rose. 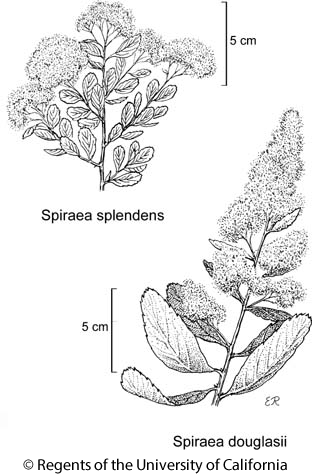 Citation for this treatment: Daniel Potter & Thomas J. Rosatti 2012, Spiraea splendens, in Jepson Flora Project (eds.) Jepson eFlora, http://ucjeps.berkeley.edu/eflora/eflora_display.php?tid=45211, accessed on April 19, 2019. KR, CaR, SNH; Markers link to CCH specimen records. Yellow markers indicate records that may provide evidence for eFlora range revision or may have georeferencing or identification issues. Purple markers indicate specimens collected from a garden, greenhouse, or other non-wild location.